DutchCrafters customers that order Amish roll top desks from this collection are amazed at the quality! Our Amish Roll Top Desk offers plenty of room for your all of your computer accessories and office supplies. This roll top desk is available in a variety of wood types and stain choices. This hardwood roll top desk comes standard with raised paneled sides and dovetail drawers with full extension slides. If you need additional desk storage space, add the top drawers to the option. Like so much of our DutchCrafters Amish furniture, this Roll Top Desk is an extremely stylish home desk or office desk as well as spacious and fully functional! 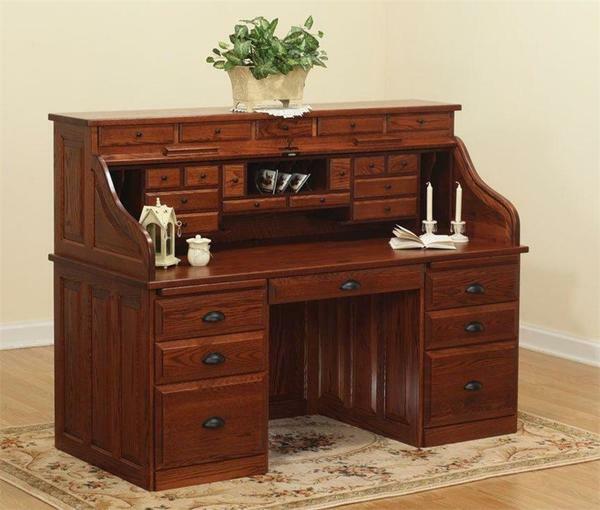 This Amish roll top desk will become a beautiful focal point in your home office or any room in your home. In our Amish roll top desks you will often find pigeon holes, hidden compartments, slots for separating bills, raised panel constrictions, and much more. Started getting organized with our Amish roll top desks and you will not regret it! Questions? Call DutchCrafters today to speak with an Amish office furniture specialist. Note: Cubby area on 56" is different than 62" and 68"
I just wanted to say that we received the beautiful bookcase that, like the desk, exceeds our high expectations. Also, the delivery guy Gary has been terrific on both deliveries--very easy to communicate and coordinate with, and the furniture was delivered in pristine condition.